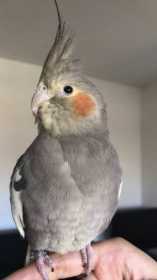 Hello, I have a lost grey cockatiel in the Springfield VA area. He is grey hair with orange cheeks, a yellow tail, and white feathers on its wings. PLEASE contact me if you find it!!!!!! He was last seen in Japonica street.